When you attend a meeting or a presentation and the speaker is lively and vivacious, you pay attention immediately. When someone has a high level of energy and is directing it at a specific point, it is called focused energy. Focused energy is magnetic and makes it clear that the person is excited about what he or she is doing. 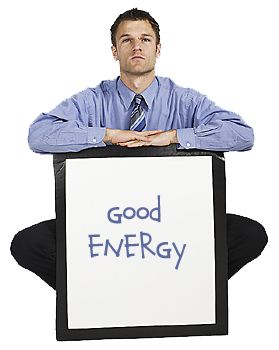 People who radiate focused energy can easily involve their audience in their presentation. Because they believe in what they are saying, the audience also believes what they are saying. To demonstrate this more clearly, recall when you were a student. Which teacher do you remember first? Whatever your answer is, it will involve the teacher who radiated the most energy, enthusiasm, and whose love of teaching was obvious to you. Now think about a class you took whose teacher you can barely remember. This teacher may have been teaching the correct material but was most likely boring and gave the lecture in a monotonous tone of voice. Proficient and charismatic communicators use a great deal of energy and their desire to teach is often driven by this energy. Children are some of the best examples of people who can capture people’s attention. They often demand attention on their time schedule with an energy and a language that works to make them effective communicators. Children are willing to cry, scratch, jump up and down, and shout out what they want; taking energy to a new level. Before you even step into the room where you will be presenting, convert any negative thoughts you may have to positive ones. You can do this by remembering positive feedback you have received in the past. This is guaranteed to help because it will remind you of a time you were successful, letting you know you can be successful again. Another way to focus your energy into positive energy is to carry out a form of meditation before the meeting or the presentation. Press your hands firmly together and close your eyes for about 30 to 40 seconds. Doing this will make you secrete adrenaline that your subconscious can then put to constructive use. Alternatively, you can go for a quick walk before you arrive at the event. This will get your blood circulating and raise your energy level. Portions of this post are excerpted from Keld Jensen’s upcoming eBook Persuasive Presentations: Influencing Decisions, Effecting Outcomes, Getting Results (Acanthus Publishing 2010) available soon.